WX Geeks: The Weather Channel's new Sunday morning talk show, reviewed. Fascinated with atmospheric physics? Can’t get enough cumulonimbus? Now you’ve got a chance to hear experts vent about the intricacies of the atmosphere every week on national television. WX Geeks (in meteorologist slang, “wx” means weather) gives a tip of the hat to the thriving weather-enthusiast subculture. Weather nerds, weather geeks, and weather weenies have long dominated Internet message boards. In recent years, they’ve come out of the woodwork in forums like the Washington Post’s Capital Weather Gang and on other high-profile sites (including, humbly, these venerable pages of Slate). Now, we have our own Sunday morning talk show. The show will be hosted by Marshall Shepherd, who is a former president of the American Meteorological Society and an active Twitter user. The first show’s topic is one I’ve written about recently: the ethics of storm chasing. We are excited for our first show, this Sunday at noon eastern! @DrShepherd2013 and Dr. Doswell discuss merits of #storm chasing. TWC execs had a rough start to 2014, with a showdown with DirecTV over carriage fees and content. As part of the effort to make peace with DirecTV, they recently promised to scale back reality shows during the afternoon primetime and increase focus on live weather. 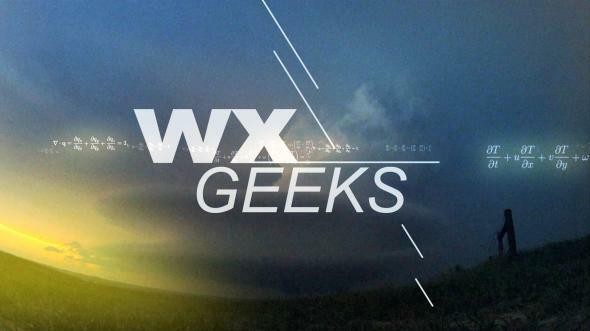 The launch of WX Geeks is further evidence they’re trying to win back die-hard weather nuts and acknowledge the increasing importance of atmospheric science in an era where weather extremes and global warming sometimes seem to create more questions than answers. Overall, I’m thrilled with the show. Just one criticism: Since WX Geeks doesn’t air live, one thing it appears to lack is interactivity—unlike Weather Brains, a popular online weather show that Shepherd praised during a conference call, it can’t respond to real-time Twitter feedback. That may wind up giving WX Geeks an even more exclusive, top-down feel. The show’s producers have reached out to experts and peers in the meteorological community for ideas of future topics and possible guests, but that’s not the same thing as engaging its audience. After watching the pilot, I spoke with Shepherd about his new role on TWC. It seems you might have been initially reluctant to host WX Geeks. What’s the story? You’re right. There was a general skepticism. Then it dawned on me: I’m sitting here talking to peers. I’m helping put the weather back in the Weather Channel, so to speak. I can’t really think of another talk show that purports to be a regular voice for science on national television. Is that how you see your role? I’ll give you an example: In the first episode, we talk about this crazy idea that’s been circulating about building these huge walls across the plains to block the formation of tornadoes. A tornado wall. My guest for the first episode is Dr. Chuck Doswell, one of the most revered tornado researchers we’ve had. What a great opportunity to completely obliterate what we think is a senseless theory. You’ve accomplished a lot in your career already. You’ve worked at NASA, you’ve been president of the American Meteorological Society. Now you’re hosting the first national TV talk show devoted to your science. How does this match up for you? What I’m most excited about is to talk weather with some people I admire, sometimes disagree with. I’m not as enamored about having my face on national television. More thrilling for me is to be able to talk weather and shed light on topics of national importance. I’m happy that I can move the dialog forward on pressing issues that face the weather community. We’ve been fighting for a spot on Face the Nation or Meet the Press. Now we have a time slot to ourselves, the next time climate change or a storm like Typhoon Haiyan makes news. WX Geeks will air Sundays at noon Eastern on the Weather Channel, starting July 20.